The Yankee Candle Company is the leading designer, manufacturer, wholesaler and retailer of premium scented candles, but just how do they create those wonderful scents? What process does the company employ to produce new fragrances, new images and new experiences? LoveToKnow chatted with Karen Woods, Director of Public Relations for Yankee Candles, about the creation experience. LoveToKnow (LTK): What is the process for choosing and creating new scents? Karen Woods (KW): To understand our process, let me give you a little background on fragrances. We continually produce new fragrances. It's a really interesting process. We start with over 1,500 concepts, but only 50 that make it to launch. It's not because anything is wrong with the other 1,450. We look at trends: life-sale trends, food and flavor trends, market forecasts and we look at fragrance gaps. We look at all the concepts that are available, do we need to add floral? Spice? How do the trends fit in? Are we covering it? Do we need to add something different? LTK: Do you take suggestions from your customers? Our internal fragrance committee will then review suggestions and offerings in order to make recommendations. LTK: So Yankee Candles likes getting the consumers involved? KW: Absolutely. We want our consumers involved and we get them developing our fragrances. The label, the color and the scent should all blend together. We work with our consumers to test the fragrance. We look at the scent first. Does the scent make sense? What comes to mind when you take that first whiff? What do the bottom notes and middle notes communicate to the consumer? Then we color it to see if the color makes sense with the fragrance. For example, if you presented a Fresh Cut Roses candle to someone blind, the fragrance of the roses would evoke the images. But, if you presented that same scent in a black candle, that might be odd and off putting to our consumers. So we want the color to draw you to an expectation. We want the label to draw you to the same expectation. If you see a rose, you are expecting roses and that's what you want to smell. LTK: How often do you launch fragrances? KW: We release new scents and candles several times a year with our seasonal and holiday collections. Even when you have the tried and true scents, our customers want to check out what is new. We need to balance it with the familiar and the new to give the consumer something to try and be excited. LTK: What leads you to retiring a fragrance? KW: Every year we look at them and we see how they are performing, many times when we're introducing a new fragrance, we will retire them as their performance. When we have similarity in color and fragrance, we look to tweak or revamp. For example, in our vanilla collections we have French Vanilla and Sugar Cream - both are very different. We can have two or more similar scents, but the differences are subtle. The Yankee Candle Company sells premium scented candles via more than 500 retail stores located in 44 states, direct mail catalogs and their website. The company releases fragrance collections multiple times a year in addition to their regular stock. LTK: Let's discuss your collections. What is the difference between a limited edition and a trend collection? LTK: What other trends are popular in 2011? LTK: What about retired fragrances? KW: Our Treasures collection lets us reintroduce fragrances that were retired, but they will only be produced in the large jar. 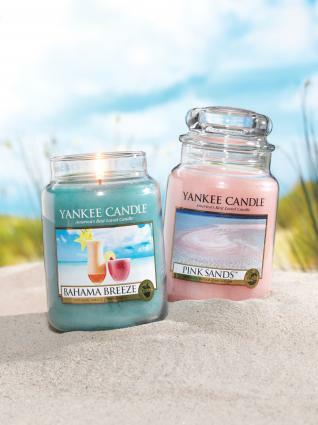 Fragrances like Root Beer Float and Roses of Cliff Walk that have been retired may become available again with our Treasures collection for a limited time, allowing our consumers that opportunity to find the scents they have loved in the past. Yankee Candles is also launching their wine collection in July of 2011. This collection was designed with wine connoisseurs in mind. These wine scents are ideal for partnering with a wine tasting, a gift basket or a holiday host present. LTK: Tell us about the new wine collection. KW: Let's start with a little history. We have had some wine fragrances in the past, but our consumers want scents that compliment the wine rather than smell like the wine. So what we did was introduce the stemless wine glass and our traditional jars with fragrances specifically catered to the wine lovers. The Yankee Candle Company is always looking for feedback from their consumers about what new scents you would like to see. So be sure to send your feedback to The Yankee Candle Company via Facebook, their website and by visiting their stores. Love To Know would like to thank Karen Woods and The Yankee Candle Company for their time and wish them great luck in future endeavors.